It’s a common perception that electricity can be saved only by choosing the right appliances and making sure that they are operated right. Rarely do people think about having interior decoration done right to save electricity. There are several things that people can do right to save electricity by decorating their room right. 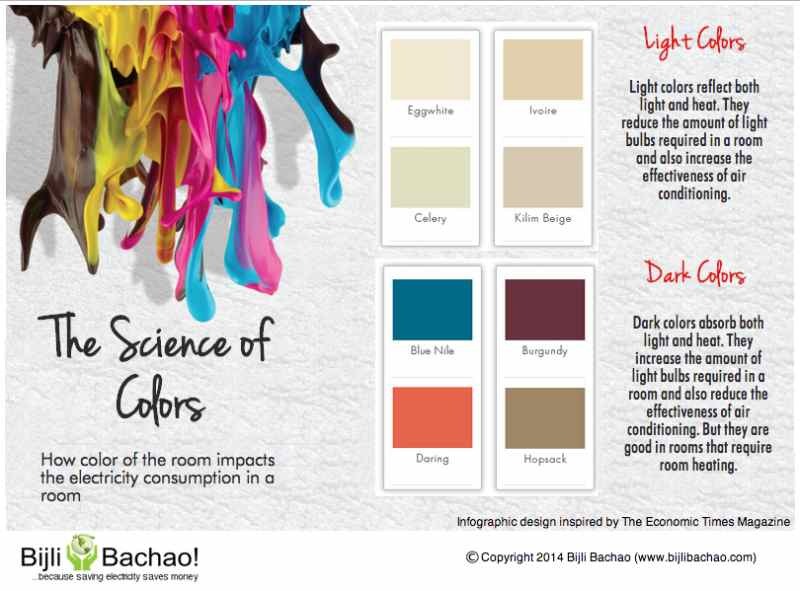 Not many people know that colour of the room can help save electricity. Right colours for the room not just impacts the mood of the person sitting in it but also the electricity bill for using lights and air conditioners in the room. Light colours reflect more light and absorb less heat. Dark colours absorb both light and heat. A room with light colour walls will need lesser lighting than a room with dark coloured walls. To have a balance, it is recommended to use light colour for walls and dark colour furniture to have the right balance. To know more click on the link. Light colours being less heat absorbent, keep the walls cooler during summer months, thereby they help in reducing air conditioner load. Even in winter season, they do not take up much of the heat generated by room heaters. Thus light coloured walls are ideal for an electricity efficient home. Furniture in a room is thermal mass which absorbs heat. If there is lot of furniture in a room, the total heat absorbed will be more. The air-conditioning load in such a room will hence be much higher. Also in case there are cupboards in the room, then it is recommended to keep them tightly closed as every article kept in the cupboard will add to the air conditioner load if left in open. Excess furniture can also block the light generated from light source, thereby reducing the effectiveness of the lights used. Thus it is important to keep rooms less occupied to save on electricity. It also makes the room look more spacious. Using natural lights and air are the freshest, cheapest, healthiest and easiest way of electricity savings. Having big enough windows that provide good light and fresh air in all corners of a room in home or office is the best way of saving electricity. Using natural ventilation instead of mechanical ventilations (e.g. exhaust) can effectively allow fresh air to come inside the room from outside. Proper care should be taken while designing (or buying) a house to make sure it has well placed windows, louvers, grills, etc. It is better to use a bigger and brighter efficient light than using multiple light bulbs of lower wattage. A 28 W T5 tubelight can be much effective than using multiple CFLs or incandescent lamps. Also concealing the lights reduces effectiveness of lights; therefore it should be done in such a way that the light is not wasted a lot. The new LED bulbs that are available in market are much more energy efficient and can add a lot to the decoration of rooms if used properly. Task lighting is another thing that can be implemented to save electricity. In case a room is to be used for multiple activities, lighting can be done in such a way that lights can be operated for individual activity. In case any activity is not being performed, the lights for the same can be kept off. A reading lamp, for example, lights only reading material rather than the whole room. It is also important to keep the lights clean as lights can lose about 50% of their brightness if the fixtures are not kept clean. A cleaner lamp can give brighter output. Thermal insulation of room is very important for effective air conditioning. Keeping the heat out should be your first priority to reduce air conditioner load. Using double glazed glasses and/or curtains for windows can effectively prevent heat coming in the room during summer months. Heat from walls can also be prevented by putting thermal insulating wall papers instead of painting the walls. Effective thermal insulation can reduce up to 40% of air conditioner load. Effective interior decoration can not only make your rooms look good, they can also save electricity and provide healthier living. It is very important to take care of all these tips while building or buying a house as this can save you a lot of money in future.